Ophthalmic issues require thorough examination, accurate diagnosis and effective treatment to prevent loss of vision, loss of coordination or additional problems. 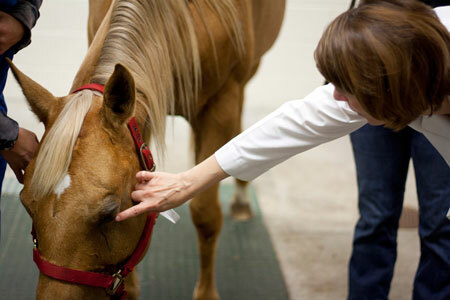 The board-certified veterinary ophthalmologists at the University of Florida in Gainesville provide a full range of diagnostic, surgical and therapeutic treatment of horse and large animal eye disorders. Contact us to schedule an appointment. 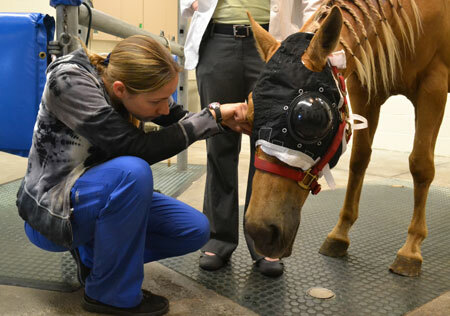 The UF Large Animal Ophthalmology service is one of the busiest in the world. This group accepts referrals from the nearby horse community of Ocala in Marion County as well as from the entire state of Florida, parts of southern Georgia and Alabama. Our service even sees horses from as far as Kentucky, Texas, Minnesota, Oregon, New Hampshire and Vermont. Our ophthalmology group accepts the difficult horse eye cases that are turned away elsewhere, and consistently achieves impressive outcomes in horses with very serious eye problems. Regardless of the problem, each horse gets the same level of attention and degree of clinical oversight. This synergy of collaboration has often resulted in innovative treatment options for many horses with severe eye diseases. Referring veterinarians are contacted by phone during the examination, and updated on the case and treatment plan. Discharge instructions are detailed. If a recheck is needed, the appointment is generally made before discharge. We maintain a friendly atmosphere in order to give the clients top-level professional and personal treatment for their horses. We are also very sensitive to managing complex problems within the constraints of the parent hospital or farm. Each horse that has complex eye surgery is generally hospitalized for several days and has a subpalpebral lavage system installed in the eyelid of the operated eye. Serious eye problems like infected ulcers, stromal abscesses, and periocular tumors require hospitalization, and the University of Florida has a very large facility to deal with horses with severe types of eye problems. Each patient is examined daily in the same manner as the outpatients. Inpatient exams are a group effort involving our senior clinicians, residents, and the fleet of technical staff on the service that day. Deep lamellar endothelial keratoplasty (partial thickness corneal transplants) is an innovative microsurgery technique developed at UF for horses with corneal stromal abscesses. Corneal stromal abscesses were a common cause of blindness in horses prior to development of this surgery. Penetrating keratoplasty (full thickness corneal transplant) is utilized for deep corneal ulcers in horses. The equine ophthalmology group at UF has pioneered the use of double amnionic membrane transplants for successfully treating horses with catastrophic corneal disease. Cataract and glaucoma surgery in foals and adult horses is also being performed. The corneal, glaucoma and cataract surgeries are performed by the board-certified veterinary ophthalmologists and are assisted by their team of residents. Each procedure requires a marvel of skill, technology and experienced surgical judgment and economy. The most involved procedures can take up to four hours to complete. Each horse that has complex eye surgery is generally hospitalized for several days and has a subpalpebral lavage system installed in the eyelid of the operated eye. Each lavage treatment involves injection of a small quantity of topical drug into the tube followed by a bolus of air to propel the medication onto the globe. The next medication is administered in a similar fashion a few minutes later. Postoperative patients and intense medical cases receive up to six sight saving medications through the lavage tube at a frequency of six to 12 times a day.